Here's an easy tip that can help any guitarist to play better guitar by increasing your motivation to practice more often. I'm sure we've all heard before that the only way to play better guitar is to practice, practice, and then practice some more. But every day you are bombarded with many different demands on your time, advertising messages pulling you one way, the wishes and desires of friends and family pulling you in other directions. It can be hard to make the time to focus on what you want to do - play guitar. But there is an easy way to fight back. You can create your own powerful advertising messages that will stimulate your desire to play guitar all through the day. One easy way to create these messages to yourself is with guitar picks. 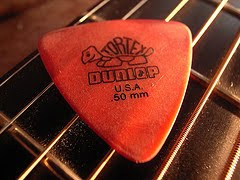 Guitar picks are great because they are inexpensive, take up little space and don't intrude too much. All you have to do is take yourself a handful of guitar picks and sprinkle them around your life so they'll be a constant reminder of your desire to play guitar. Here are a few things I like to do with my picks that might work for you too. In short, leave guitar picks in all the places you frequent during your day. Each time you see a pick you'll be reminded of your guitar, of that song or exercise you are working on and you'll get that itch to play play and practice again. These frequent reminders will tickle your desire to play guitar throughout the day and when you get home in the evening you'll be motivated like never before. Give it a try, take a few of your guitar picks and start spreading them around your life today. You know it's funny because I never thought about this but when I look around my house there are pics everywhere. When I have them in my pocket I'm always fidgeting with them. Great idea. Subliminal persuasion on yourself.